What Is an Indian Tawa? In Indian, tava or tawa is a commonly used frying pan in many kitchens. Also known as a tawah thawah or thavah, the pan is round and varies in diameter from between 8 inches to 12 inches. It can be up to a meter wide in some professional kitchens. A tawa is usually made from cast iron or aluminum. Tavas are used quite similarly to Woks in Asian cooking, as they are moved around the pan to ​stir-fry vegetables. 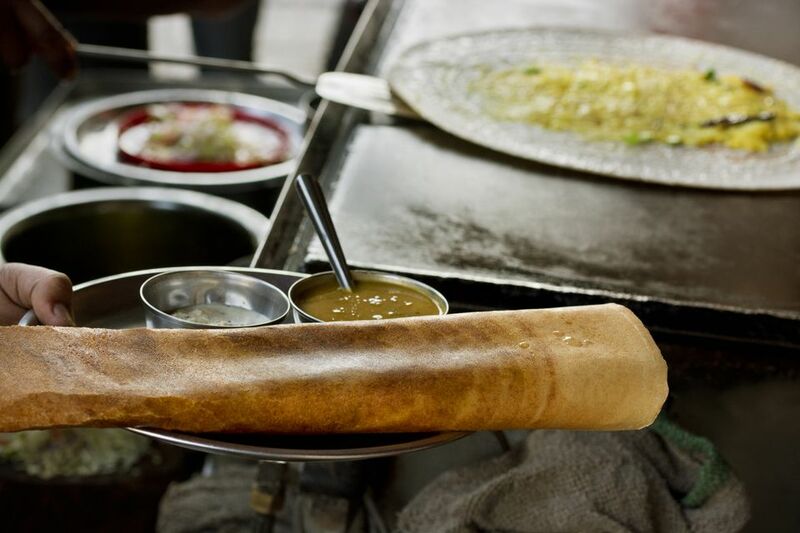 They are also used to prepare all kinds of flatbreads ranging from Chapati and Paratha to Dosa and Cheela. A tava may or may not have a handle. The tava can also be referred to as a tapa, saj or sac. They can be flat, but most are convex or concave in shape, and may also be made of sheet iron or steel. Imagine using both sides of a pan; that is how the tava is used in Indian cultures. One side is great for making leavened and unleavened flatbreads and pancakes, as well as pitas, pesarattu, and chapati. The tava can also be used to fry foods in South Asia, where they use it to cook chaat, pav bhaji, and tawa masala. Fish can be fried inside, as well as meat. In short, a tawa in Indian culture is a versatile cooking pan. Here are some popular utensils used in Indian cooking. Belan: This is an Indian rolling pin, which is lighter in weight and thinner than the rolling pins that you may see in the United States. The edges are tapered and it is used to create puris, chapatis, and naan bread. Patli: This rounded wooden board is commonly used with a belan. It is a rolling surface, basically, because not all kitchens in India have countertops. Many people without countertops use this to roll out dough while sitting on the floor. Pressure cooker: Most of us know what a pressure cooker is, and they are a staple in the Indian kitchen or restaurant. There are five to six dishes in a typical Indian meal, so this is a must-have in order to quickly prepare ingredients and save time. Chimta: The chimta which is also called a chippio, is a pair of tongs, essentially. They typically have pointed tips and are made of iron or stainless steel. These tools can be used with a tawa to flip flatbread or holding them above flames to attain a light charring effect. Jhaara: There are plenty of foods that are fried in popular Indian cuisine, so having this utensil helps keep them in place so they can cook. It's a round metal spatula that allows items to be held in oil and allows the oil to drain off when the item is pulled out of the liquid.